A fun fact of life is put on this t-shirt. 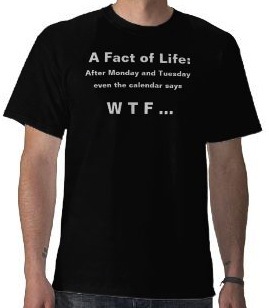 The t-shirt starts with “A fact of life:” and then “After Monday and Tuesday even the calendar says W T F …” and you have to say that this is pretty funny. And that is why you can just get a t-shirt like this for everyday of the week in different colors and styles and for you whole family. Come check out this After Monday And Tuesday Even The Calendar Says W T F T-Shirt.